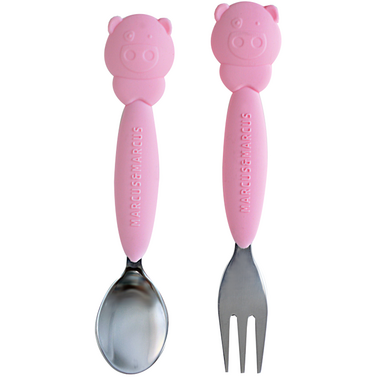 Make mealtimes exciting with Marcus & Marcus’ Pokey the Pig animal themed fork and spoon set. Utilizing the easy-grip silicone handles and stainless steel tines makes feeding easier for adults while the soft bright colours are perfect for little hands and gentle on gums. The silicone is soft and they are adorable, but the stainless steel part doesn't look very bright.